At Real Pickles, we’ve been fermenting Northeast-grown vegetables for well over a decade. When Real Pickles got started in 2001, there were only a small handful of commercial vegetable fermenters anywhere in the country. We’ve learned a lot over the years! 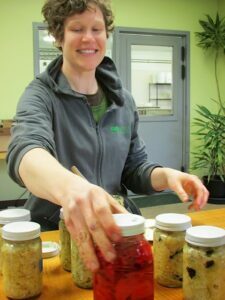 I recently talked with Heather Wernimont, our Fermentation Manager and newest worker-owner of the Real Pickles co-op, to get the latest on fermentation at Real Pickles. Among other things, we chatted about the 2014 production season, what it’s like to get paid to taste pickles, and the similarities between cucumbers and baby goats. Heather organizes jars for new product tasting! KH: What do you do as Fermentation Manager? HW: I work in a team of three production managers. My role is to oversee the making of Real Pickles products from start to finish. This includes planning for all of the vegetables that we buy from area farms, figuring out when we want them delivered, and processing the vegetables. I monitor the barrels during fermentation, tasting them to determine when the product is done fermenting and making sure we are consistent in the way we pack them into jars. I’m also responsible for maintaining our organic certification and working on new product development. KH: Real Pickles fermented 300,000 pounds of vegetables in the 2014 production season. How do you go about doing that? HW: Our season usually starts in late June when the local cucumber harvest starts and ends in January or February with our last batches of beets and carrots. So we have seven or eight months to do all of our processing of fresh vegetables. We have a production staff of eight or nine people each day who do the work of prepping vegetables, from washing and peeling to coring and shredding. We have a processing machine that we use to shred cabbage, slice onions, grate carrots and that sort of thing. We wash a lot of vegetables and cut all of our cucumbers by hand! We mix the vegetables with salt and spices and pack them into barrels to ferment. All of this work is very labor-intensive. Our kitchen crew is pretty amazing! KH: Was there anything unusual about this past growing season that impacted Real Pickles? Delivery! 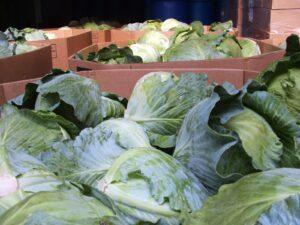 Bins of fresh cabbage waiting to be sliced and spiced. HW: Every growing season looks a little different so we know ahead of time that we’ll need to be flexible and not get stressed out when the days don’t go as planned. This past summer started off nice and warm with lots of cucumbers coming in at the end of June. Somewhere around the last part of July, temperatures at night became very cool and caused the cucumbers to slow down significantly. Once we start getting into August, downy mildew is a threat so we really need to make as many cucumber pickles as we can as early in the season as possible. We were pretty nervous going into August but ended up being able to source the cucumbers we needed from a grower in the middle of the month.We try to stay a step ahead and have some backup work for staff in case there are gaps in our vegetable deliveries. We sometimes fill days peeling and prepping garlic, or we’ll get some summer cabbage for an early batch of sauerkraut. We can also pack finished pickles into jars, which is the work we typically save for winter and spring when we don’t have fresh vegetables coming in.Sometimes, we have the opposite problem. At the start of the season this past summer we were expecting a delivery of around 800 pounds of cucumbers from Atlas Farm. Instead, Gideon called in the beginning of the week and said, “I have 3,000 pounds. Can I bring them over?” We said yes — and it was intense! KH: Do you ever have to change production plans in the middle of the season? HW: Around the beginning of September, we realized we were going to need to make much, much more kimchi than we had originally planned to keep from running out in the spring. We had made all of our contracts with vegetable farmers in March. Then all of a sudden customers couldn’t seem to get enough kimchi, and we needed to make more.Sauerkraut would be easy — you find some cabbage, salt and spices and figure out the staff schedule and you’re done. Kimchi is complicated – it takes two days to make one batch and there are lots of ingredients to source from multiple farms. We have to look for napa cabbage, carrots, leeks, garlic, ginger, habaneros. Luckily, this year the leek and carrots harvests were good so those were easy. Finding enough napa and garlic was harder but we found what we needed and made an extra 20 barrels — that’s about 800 gallons of extra kimchi! KH: What are the biggest challenges in your job? HW: At our peak production, we may have about 425 barrels fermenting at once. I need to stay on top of all of them, tasting them when I think they might be done fermenting. Right now, we have two fermentation rooms and we can control the temperatures in both of them. So if we have a lot of barrels that might be ready all at once, we can move some of them into a cooler room to slow down the fermentation a bit. That way we spread out when the different batches are ready. We don’t have a lot of extra space at our facility and have to manage space carefully. We have to make sure we get batches out of barrels and into jars to sell so we can use that barrel again. My job requires a lot of planning, flexibility and creative problem solving all at once. I love the challenge. KH: How do you figure out whether a batch has finished fermenting and is ready to pack into jars? HW: I’m looking for taste and texture. We want the flavors to have melded properly so they don’t taste like raw vegetables, I make sure whatever spices we’ve used have blended in with the vegetables. The level of sourness needs to be right. The sugar levels in the vegetable vary over the season and this contributes to how quickly the vegetables ferment so each batch is different. I can’t just assume that it will be ready in a certain number of months.Taste and texture is most important, but lately we’ve done some testing of acid levels and remaining vegetable sugars to deepen our understanding. We also pH test every batch as an extra step to make sure the finished product is safe. KH: Do you ever experiment with different vegetables? HW: Yes! We canceled production a couple of days because of snow storms this past winter. I used the time to make 28 different experiments! I focused on some different kimchi recipes and tried some vegetables fermented with hakurei turnips and radishes. We have some great orchards here in western Massachusetts so I also made some recipes with apples and pears, which can add some sweetness to fermented vegetables. I wanted to try some new flavors while also staying in line with the simplicity of our current product line. KH: You did all of the vegetable purchasing for Real Pickles this past year. How did that go? HW: I really enjoy working with the growers. We have some amazing long term relationships that Dan and Addie Rose started over a decade ago. All of the farms we buy from are small to mid-size family farms, but the growers’ operations are quite different. For example, I do most of my planning directly with Casey at Old Friends Farm over email. Dave Chamutka, on the other hand, is hard to catch by phone but I know he’ll be making the delivery himself so we always talk in person. 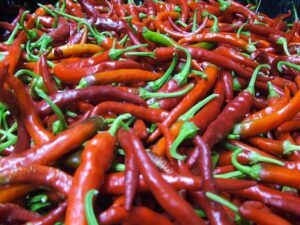 With Red Fire Farm, I make arrangements early in the season with Ryan, one of the owners, and then later work with the wholesale manager. We are lucky to have such great people to work with. KH: Before you started at Real Pickles you worked as the Education Program Manager at Sprout Creek Farm, an agricultural educational center and maker of award-winning cheese, in the Hudson Valley. Do you see any similarities between these two jobs? HW: Kidding season and cucumber season are remarkably similar! You can know that fifteen goats are going to give birth but you can’t control when the kids are going to come; it’s the same with cucumbers. You may know cucumber season will be starting soon but everything changes when the first truck pulls up with bins of cucumbers! KH: What’s been your favorite aspect of the job? HW: Here in the Pioneer Valley, we have access to so many high quality organic vegetables that ferment in such amazing ways. I’ve loved learning about the subtleties of fermentation and working with a live product. There may be differences in how the vegetables ferment as a result of the amount of rain a farm received, the time of year the carrots were harvested, the variety of the cabbage, or the soil profile of a particular farm. We aim for consistency, but due to the nature of a wild fermentation, some variations between batches occur. I like to think that these differences are what make our products so interesting and delicious!